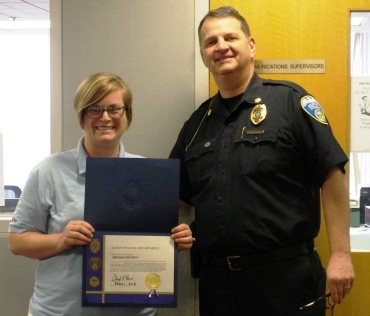 Kaitlyn is a dedicated Safety Communications Technician for the Akron Police Department. Thank you for all your hard work, Kaitlyn! Megan Prunty, of the City of Akron's Safety Communications Division, received recognition from Police Chief Kenneth Ball II for providing instructions with a caring attitude to a frantic mother who found her two year old child unresponsive. Her calm demeanor, clear instructions, and professionalism were exemplary. The recognition was presented by Police Deputy Chief Michael Caprez. 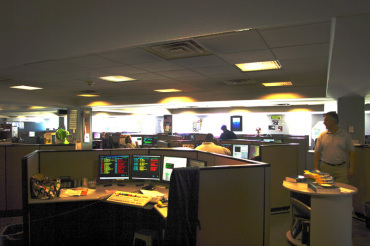 The City of Akron's Combined Communications Center was opened in November of 1996. 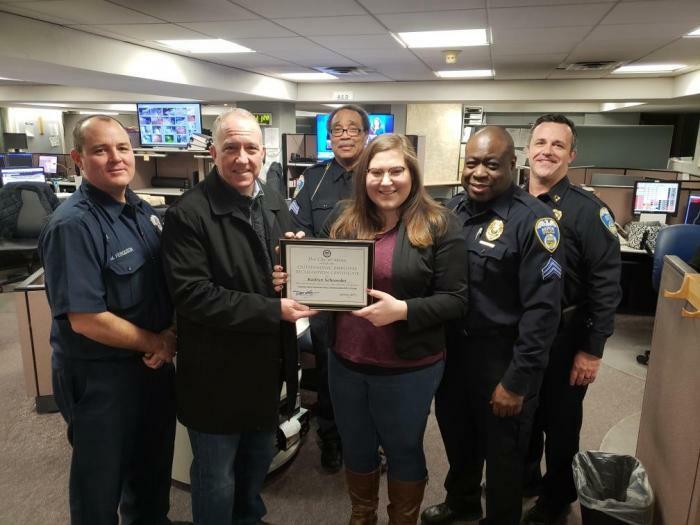 It combined the Police dispatch center and the Fire dispatch center into a single operation which allowed for a more streamlined approach to handling calls from citizens. The Center is staffed with 62 dedicated safety technicians, supervisors and support staff who provide an essential service to the citizens of Akron. The Safety Techs, which include dispatchers, call takers and other support roles, work 10 hour shifts to provide 24/7 coverage to the citizens of Akron. The Director of the Combined Communications Center is Capt. Brian Harding. The assistant director is Lt. Steve Phillips. Most of the combined Communications center technicians are cross trained to handle several disciplines. They are trained in call taking for emergency and non-emergency scenarios, LEADS operations which is the Law Enforcement Automated Data System, the services position, and Police, Fire and EMS dispatching. This allows for a well-rounded and experienced employee. The call takers handled around 385,000 calls last year. They ask pertinent questions and then assign it to the appropriate dispatcher. If the call is medical in nature the call takers have received specialized training and the types of questions they ask will give the first responders valuable information about the patient while still in route to the emergency. At the end of the questioning the call taker, if appropriate, can give the caller potentially lifesaving instructions until help arrives. Call takers can assist the caller with such things as CPR, Child Birth or a Choking victim just to name a few. 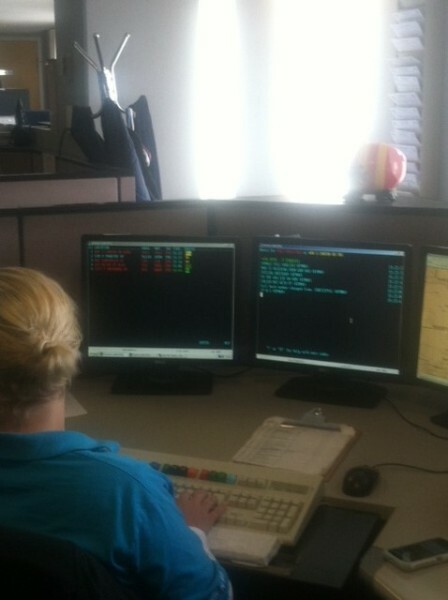 The dispatcher will then coordinate the appropriate Police, Fire or EMS response. In addition to their daily duties some of our Dispatchers and Call Takers volunteer to go out into the public and educate school children and other groups about the proper use of 911. We use a telephone simulator that allows the children to actually dial 911. We explain to them what to expect when they have to call and we also discuss when it is appropriate to call. They are then given the opportunity to make practice calls. Each year we select several calls made by children and honor them at an awards ceremony. The Combined Communication Center recognizes the importance of effective and accurate communication between its personnel and the community that they serve, including those individuals with limited English proficiency. Hampered communication with limited English proficient victims, witnesses, and community members can jeopardize safety for first responders and citizens. We have procedures and conduct training to address this difficult situation when someone with limited English calls the center. Employees at the Center also believe in giving back to the community. We raise money throughout the year for various charities. Nine-one-one is only to be used ONLY in emergency situations. An emergency is any situation that requires immediate assistance from the police/sheriff, the fire department or an ambulance. If you are ever in doubt of whether a situation is an emergency you should call 9-1-1. It's better to be safe and let the 9-1-1 call taker determine if you need emergency assistance. When should you call the non-emergency number? Certain situations, though criminal in nature, may not require immediate attention, such as crimes where the suspects are gone and there are no injuries, vehicle complaints, neighborhood issues or civil matters. For these incidents please use our non-emergency numbers, 330-375-2181 and 330-375-2101. These numbers are still answered by a call taker 24 hours a day, 365 days a year. 311: Your one call to City Hall. The City of Akron prides itself on being responsive to the citizens needs and our goal is to take action on your concerns. We want to get the right information to the right people, so we can take the right action to resolve your neighborhood concerns. The following are reasons you could dial 311; Animals running loose, dead animal removal on public property, high grass and weeds, property and housing issues, dumping, junk vehicles, potholes, traffic signs and signals, snow and ice, water service and other similar concerns. If you are outside of the City limits but need to call the Akron 311 center, dial 330-375-2311.